Ksamil is a small coastal village 15 minutes south of Sarande and just north of the UNESCO World Heritage site of Butrinti. There are a number of small hotels and restaurants on the mainland all serving fresh fish from the local waters. Three are also four small islands you can easily swim to (or hitch a cheap boat ride to) which each have small bars where you can get a drink. A beautiful little oasis with a lot of potential. See the full size panorama here. 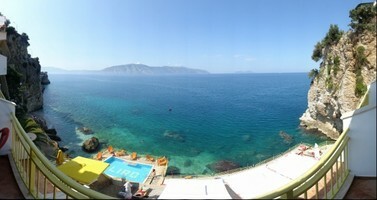 Nestled into the cliffs overlooking the Ionian Sea, Hotel Liro in Vlore, Albania is a rare experience. Offering balconies almost straight above the clear, cool, transparent Mediterranean waters. the hotel offers free use of kayaks, canoes, a pool, scuba, and various water sporting equipment. The restaurant and espresso bar are pricey by Albanian standards, which means, for only $15 a person, you can eat an excellent meal with two appetizers, a main course, and beer or wine. The private beach below is made up of smooth rocks, but I suggest aqua socks or sandals. What I love about the Ionian Sea is that just a few steps out from the shore and you are above your heads (a haven for cliff-divers). You can literally dive into the ocean from the shore. Three years ago we stayed in Vlore at a hotel above the cliffs where Liro sites — we didn’t see even the hotel until after we had checked in at the other hotel. We vowed to stay at Liro on our next trip and this time we spent three days and nights and we loved every minute of it (September 1 to September 3). Vlora beach in southwestern AlbaniaThe city of Vlora, known also as Vlonë, or Valona is located in the southwest of Albania, with a population of 61,300 inhabitants. It is in front of Karaburuni peninsula and Sazani Island, close to various sandy and rocky beaches and the scenic mountains. Vlora is Albania’s second largest port, having regular ferry boat connections with Italian ports of Bari and Brindisi. The city is rapidly expanding with massive hotel developments. The downtown coastal region is literally starting to look like Miami — I kid you not. Vlore and Hotel Liro is a must visit if you find yourself visiting Albania. Kejda and I spent the afternoon at Ksamili Beach, a place she visited many times with her parents as a child. About 15 minutes south of Saranda, this is a much quieter beach (and slightly cleaner) beach than what is available in Saranda harbor. 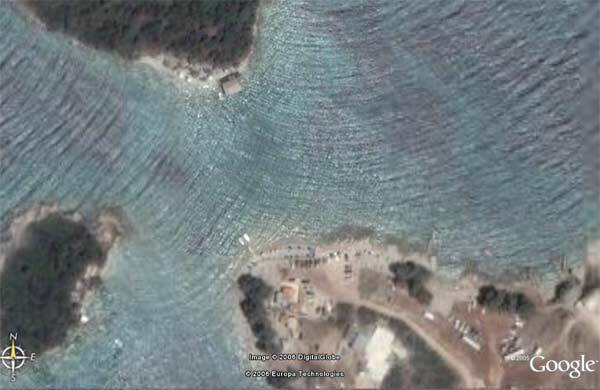 We both swam across the waterway to the island in the Google Earth screenshot above. The water was warm and gentle and save for a lone cow rummaging through a dumpster on the way out, this is one of the nicest beaches in Albania we saw.